Every year since my son’s fourth birthday, I started playing good funny April Fools jokes on him and he does it back to me; I make it believable just enough and I fool him still to this day every time and make him laugh but, he still has not put one over on me (but, he keeps trying). Also I play April Fools on my father and I fool him every year and he laughs (I used to do it to my late mother and she got fooled and laughed also). I won’t reveal my April Fools jokes but, I will give you a list of 10 things that you can joke about. 1. Food; what you are serving for dinner say some exotic food that you normally don’t eat. 2. You won the Publishers Clearinghouse Sweepstakes (don‘t do it if someone has a weak heart). 3. You invited their favorite celebrity to dinner and they accepted (again, do not do if someone has a weak heart)..
4. Buy a magic trick such as a cup that trickles when you pour a drink in it (serve only non staining drinks or water). 5. Ring the bell and say someone is here to see you. 6. Ask someone to take the dog out to make and you already just did. 7. Say that you are buying a monkey as a pet. 8. Ask your family to wash and clean the car and you already did it. 9. Tie a family members socks all together in their draw. 10. Hide the remote to the TV. 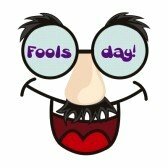 I hope that all have fun and do only good jokes to each other today on April Fools Day!